During the last decades an increasing interest in microbial cell wall agents has been established, since exposure to these agents has been linked to a wide range of adverse and beneficial health effects. The term microbial cell wall agents refers to a group of molecules of different composition that are integral structural components of microorganisms like gram-negative and gram positive bacteria and fungi. The available information on exposure characteristics for these cell wall agents within indoor environments and their associated health effects is summarized in this chapter. 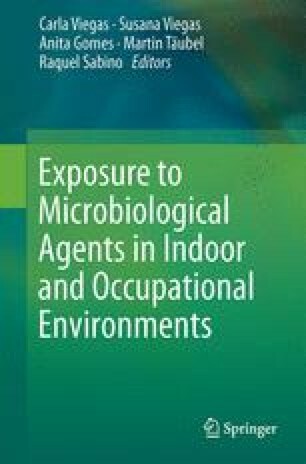 Large variation in exposure levels of microbial cell wall agents in indoor occupational environments is documented, whereas actual airborne levels of exposures and determinants of residential indoor air are lacking. Standardisation of methods for determination is highly recommended for future studies. Endotoxins, cell wall agents of gram-negative bacteria, are well studied and involved in the development of adverse and protective health effects, but for cell wall agents of fungi, like glucans the evidence is more limited and inconclusive. For other microbial cell wall agents, like muramic acid, EPS and ergosterol, studies have been sparse and very diverse in their design and applied methods. Future recommendations include studies in large populations with a longitudinal design involving both exposure assessment and health effects assessment of distinct microbial cell wall agents and co-existent microbes, which is needed to understand the role of individual and combined exposures in health. OSHA (1995) Subpart Z - Toxic and hazardous substances. Standard Num: 1910.1000. In: Occupational Safety and Health Standards part 1910. Available via https://www.osha.gov/pls/oshaweb/owasrch.search_form?p_doc_type=STANDARDS&p_toc_level=1&p_keyvalue=1910. Accessed 05. Occupational Safety and Health Administration.